'These tubes WILL drive you mad!' My second supervisor laughed as I failed, yet again, to roll the flimsy plastic into a tube. 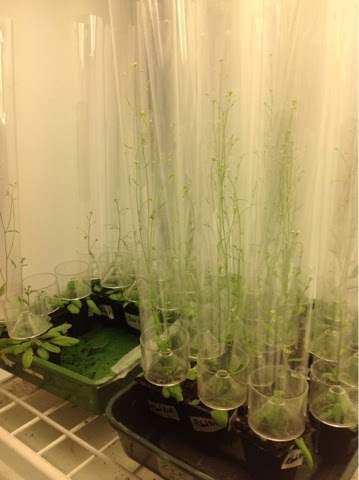 And why was I attempting to wrap cellophane around my Arabidopsis plants, turning them into a mad parody of a ornamental carnation for a florist? The answer : it is, apparently, the easiest way to collect seed from a flowering Arabidopsis to stop it getting mixed up with that of others. I am nearly ready to use my interesting defence-signalling mutants for my first infection assay with the parasitic weed Striga gesnerioides. These could provide a clue as to what defence pathways in the host plant's immune system have a role to play in a resistant interaction. But first, I have to bulk up the seed for each mutant line, so that - if I find anything interesting- I can put on a very big experiment to collect some concrete data. But as these mutant lines each have different genes knocked out, it is ESSENTIAL that I keep the seed separate and carefully labelled so I know what is what! Hence the tubes: these should keep the flowers separate, preventing cross- pollination, and the seed should fall into the plastic bases where I can collect it later. That is the idea anyway. I don't think I can count on being a florist if the PhD doesn't work out, as it takes me an age to wrap and set up all my tubes. It sums up the general way of my work at the moment, with quite a few frustrations. After Striga failed to infect my first tobacco plants, I have the second attempt now underway: hopefully the combination of using a sandier soil mixture, a cooler growth chamber and more nutrient solution will do the trick this time. I have also swapped over my growth chambers this week, switching the long day ( 16 hours of 'daylight') to short day ( 9 hours of light) and vice versa, to give me more space for my infected rhizotron systems. So that was a stressful day heaving all my plants about! At least the cabinets are on the same floor! Today we had our first lab meeting for a while which resulted in more work for me, and all of us in the lab. The potting area in the annexe, where we keep our plants, is in disarray and we have all been told to keep on top of it and make sure it is tidy. We all received an email saying that 'an improtant guest' is coming to look round next week , so that will give an incentive! Our supervisor has also decided we need a rota to clean the big growth chambers full of the rice, maize, tomato, etc that the rest of the lab work on. Fortunately, as I don't really use these chambers, I haven't been out on the rota but instead I need to keep my two growth cabinets clean. Which is very tricky when the non- adjustable shelves have a good gap between them where the dust and dirt catches! I am thinking of investing in a little vacuum cleaner... But it is all part of the usual problem solving that being a researcher is all about. Thanks for share information, Great post brother. Well done you!